Yesterday, I got to play mommy for a few hours in the afternoon. This doesn't usually happen, so it was fun. I walked six little 3rd graders from school to the Roco dance studio. All happily munching on the chocolate chunk cookies I brought and chatting like crazy. As I sat at the dance studio pretending not to watch, I flipped through the current issue of Body + Soul magazine. 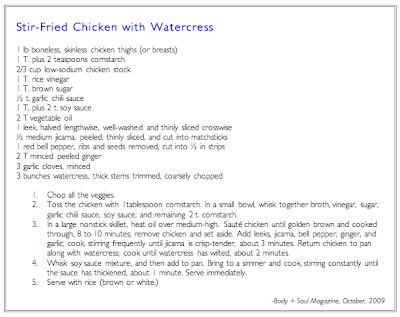 A recipe for Stir Fried Chicken with Watercress really looked delicious. It has some unique ingredients that I don't usually cook with like jicama, watercress and leeks. And as a bonus - it's healthy for you! Now let's see if it tastes good. Time to go to the store. First, I had to go to two stores. One would have worked if I had gone to Whole Foods first. But I didn't. So if you make this, just head on over to Whole Foods for the ingredients. Second, first thing to do is chop all the veggies. Which is pretty standard with a stir fry dish. There aren't that many, so it makes it really fast to cook if everything is chopped before you start cooking. Now add the watercress and chicken back into the pan. Now plate it up and eat it!! And the verdict is.........."It was good and crunchy!" says Elli. Don said, "It was quite yummy." That means he liked it. And I say "yummy yummy in the tummy. It tasted fresh and de-lic-ious." Another keeper. Here's the recipe. Hopefully you can click on this image below and it will print fine and dandy for you. I really need to figure out how to attach printable recipes. Of course we had some FABulous wine with dinner. 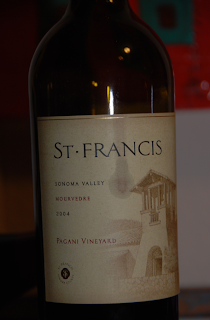 Don opened a bottle of '04 St. Francis Mourvedre from the cellar. It was really good. We really need to go wine shopping before we totally deplete the cellar. The nice thing about drinking these "cellar" wines is that they have aged just a bit, and are so smoooooooth. A few years of quiet contemplation in our cellar does a wine good. Yes, I'm talking about the wine. I don't keep Don in the cellar. He wouldn't fit. It's a very small closet, I mean cellar. And now, tonight is date night!!! Woo hoo! Elli has a sleepover. We're going out. I need a plan! Where to go? What to do? aaaaah, no little people at dinner to bug to eat, and sit down, and quit fidgeting, and blah, blah, blah........ I may sit there in total silence and be totally, completely, content! I just printed this one and can't wait to try it. I also printed the chicken Picata recipe from Ellen's site and YUMMY can't wait to try that too. Thanks! oops! I meant to say Elise's site! Love it! It's so good. The ingredients are tough to find though. But worth it if you do find them.